Updated Files from the JBC. Here are the two files presented at the last JBC meeting. Here is the update from the meeting on February 19, 2013. Here are the documents from the Space Study Discussion on November 1, 2012. The new pages for the secondary space study are below. These include the cost estimates. The link below takes you to the rest of the report. Here are the pdf files for the updated elementary space study. The changes included here are: A larger additon at School Street and Nancy Loud School. Those larger additions would then eliminate the need for additions at Chamberlain Street School and William Allen School. The East Rochester School options are also included in this update. The space study documents are options for the School Board to consider when making decisions. The solutions should not be considered as recommendations by anyone at this point. Here are the files for the Secondary School Space Study. Spaulding High School with the Richard Creteau Technology Center and Bud Carlson Academy. 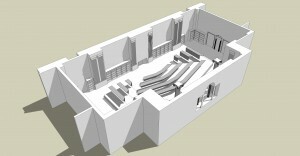 The mock up of the Grierson lecture hall. The Building Committee began looking at East Rochester Construction options on June 20, 2012. I have attached the pdf file of the documents. I have included the newly updated space study in this posting. You can see the changes listed below. I have broken up the pdf into smaller pieces. The cost on light fixtures for Maple Street was updated. I have included the space study attached to this entry. The Board is just beginning to review the study. They met on November 15th and will meet again on November 29th with the architects presenting the study. I have included the goals of the study below. I am certain that the Board will select all of the recommendations in the study and many of the recommendations will be altered. education, music, library, and cafeteria areas at each building. 8. Understand the current space utilization at each school. fl ow, parking, and outdoor student space. such as acoustics, comfort (temperature), daylighting, and air quality. Improvement Plan for the district.